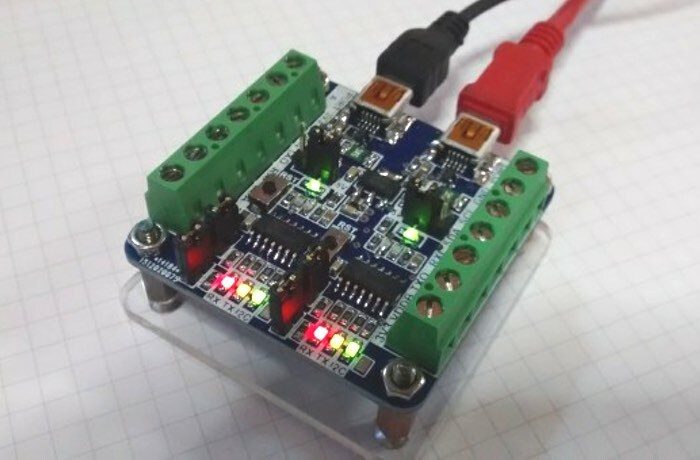 Jesus Echavarria has created a new design for a Dual USB Serial and I2C Converter he has created and released the schematic of the board making it available to download. After a couple of months with a lot of work, I come here again with the last board I develop before Christmas. It’s a dual USB serial and I2C converter based on two MCP2221 Microchip 2.0 USB-Serial bridges. I develop it as a need on my work with the last project I’m involved. I need to monitor a serial communication between two devices. With only one converter, I must choose between RX and TX lines to monitoring the traffic. With this solution, I can listen at the same time TX and RX lines, so the monitoring is more easy. And with a software like Docklight (you can download a free evaluation copy here), you can choose the monitoring option to display both channels. After the break you can find all the technical info of the board! For more information on the new board jump over to the Jechavarria.com website for details.